Cuyahoga County Court house cornerstone? Raised in 1858-1860 opposite the northwest quadrant of Public Square, the third Cuyahoga County Court house was designed by architect J. J. Husband, whose name originally was carved in the lower right-hand section of the cornerstone. Husband happened to be a Democrat, who couldn't conceal his satisfaction over the news of the assassination of Abraham Lincoln in 1865. Reports of his indiscretion spread rapidly, according to an account in the Cleveland Leader, and a mob gathered to track him down to his office and harry him out of town. Still unappeased, some of the vigilantes then secured hammer and chisel and applied them to the cornerstone of the architect's courthouse. 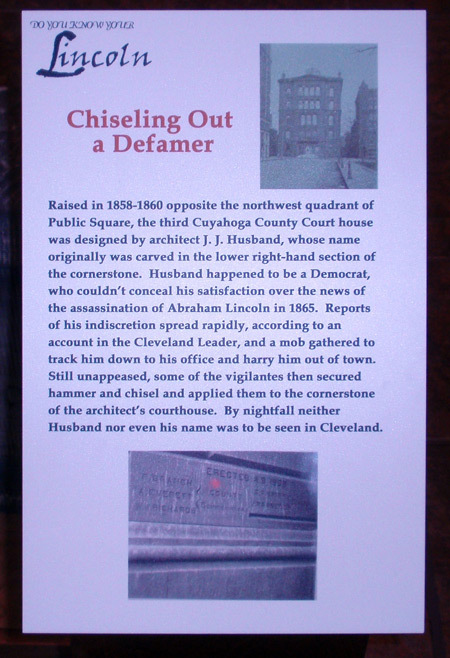 By nightfall neither Husband nor even his name was to be seen in Cleveland. 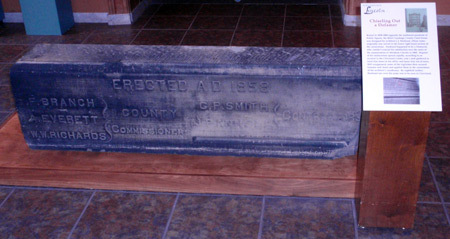 The cornerstone is on display at the Western Reserve Historical Society.